Somewhere around 1995 a group began skating together on Sundays. In 1997 the group became more organized and officially became the Sunday Bladers. The group also did the Bill Jackson skates but in the late 90’s the roller blading boom started to fade. Bill Jackson’s last sponsored every Thursday Night skate faded away in June of 2000. However one of the regular Sunday Bladers, Paul Styrcula had just worked hard to obtain his MCSE+1 Microsoft Certification and suggested he excite roller blading back to life by doing a web site for the Sunday Bladers. In July of 2000, the website SundayBlade was born. Paul and I shared the expense of $120 or so for the first year’s operation. 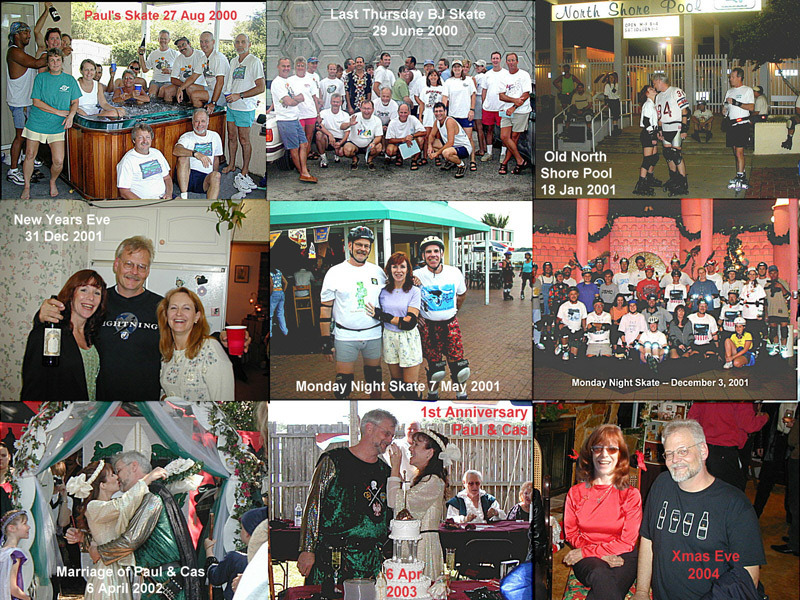 Paul’s web site looked great and was expanded to include a "What’s Up" page, a "Photo Archive" page and a "FAQ" page. What we needed to know was how to pass the cost of the web site on to all of the Sunday Bladers. A "Sponsors" page was created. Things were looking good. The year of 2001 was an active year for Paul and the Sunday Bladers. However Paul's parents were getting older and needed more and more of his time. At the same time, this lady named Cas had also been sharing Paul's time and they decided to get married. Paul had also become involved with the Renaissance Festivals and decided to get married at a Renaissance Festival. He invited all of the Sunday Bladers to the wedding and we all had a grand time. For Paul and Cas’s first anniversary, they decided to celebrate it at the Renaissance Festival and again we had a blast. Paul was reincarnated as Lord Paul and Cas as Lady Cas. Lord Paul and Lady Cas decided to build their home as part of Lord Paul’s parents home to be able to keep a better watch on them. They needed more and more help and Lord Paul’s and Lady Cas’s roller blading activities became less and less frequent. Lord Paul continued to be the Sunday Bladers web master. He diligently updated the web site every Sunday without fail. More and more items were added to the web site for all to enjoy. We all had a wonderful joy ride from the year 2000 to 2010. Ten years of fun and adventure. Thanks Lord Paul for all your time and effort for those 10 years. In October of 2010 Lord Paul finally decided it was time to relinquish the web site.